In June 2011, Google had a problem. The Federal Trade Commission (FTC) had opened multiple investigations into whether the tech giant illegally favored its own shopping and travel sites in search engine queries; restricted advertisers from running ads on competing sites; and copied rival search engines’ results. To fight this threat, Google turned to a key third-party validator: academia, and in particular one university with a long history as an advocate for corporate interests. 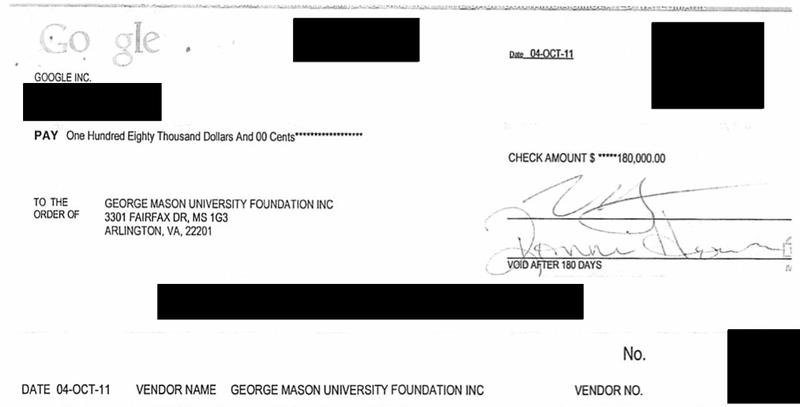 From the beginning of the FTC investigation through the end of 2013, Google gave George Mason University’s Law and Economics Center (LEC) $762,000 in donations, confirmed by cancelled checks obtained in a public records request. In exchange, the LEC issued numerous studies supporting Google’s position that they committed no legal violations, and hosted conferences on the same issues where Google representatives suggested speakers and invitees. 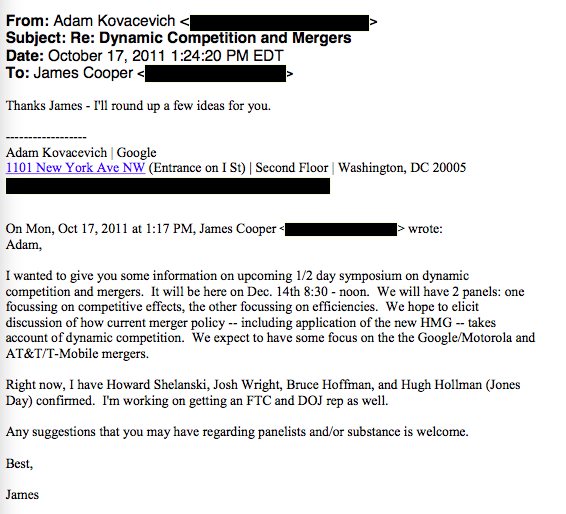 A professor at George Mason and author of many pro-Google studies, Joshua Wright, even later became an FTC Commissioner. He had to vow to recuse himself from Google-related matters for two years to deflect concerns about conflict of interest. But before Wright’s confirmation, the FTC already decided against filing charges against Google, overriding its own staff’s recommendations. Google only had to voluntarily agree to alter some of its business practices to resolve the case. Google’s actions between 2011 and 2013 show how they dodge legal bullets: by molding elite opinion, using the support of experts and academics as a firewall against criticism. The donations to George Mason and professors at other universities reveal that Google purchases that privilege. It’s just one way Google uses its war chest to influence policymakers: they spent $5.47 million on official lobbying in the first quarter of 2015 alone, and spends more money on lobbying than any public company. But the academic funding machine may be even more insidious, a stealth form of lobbying wrapped in the guise of “independent” research. Google has not responded to multiple requests for comment at the time of publication. 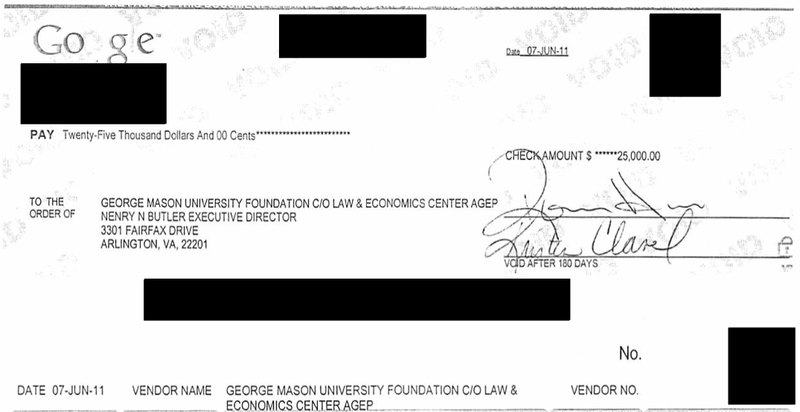 The first check to George Mason University’s Law and Economic Center came on June 8, 2011, the same month as the FTC probe was confirmed. The $25,000 donation went to “support the Attorneys General Education Program,” a division of the LEC that “provides a common forum” for education and public policy issues affecting state law enforcement agencies. The program’s Advisory Board at the time of the donation included sitting Attorneys General from Virginia, Maryland, New Mexico, Missouri, Washington, Colorado and Indiana. Google faced state investigations into their business practices from Texas, New York, California, Ohio, Mississippi and Oklahoma at the time the donation was made. John Burchett, Director of Public Policy for Google, confirmed the check delivery in a lugubrious email to the executive director of the LEC, Henry Butler. Having those solutions interact with corporate wish lists is nothing new for the university. In the 1990s, George Mason economics professor Robert Tollison created a committee that produced paid research for the tobacco industry, casting doubt on the dangers of second-hand smoke and the effectiveness of higher cigarette taxes. Google discloses its support for the LEC, but does not state specific funding levels. Similarly, George Mason lists Google among its corporate donors – which include cigarette giant Altria, the American Bankers Association, oil companies ConocoPhillips and Exxon Mobil, weapons manufacturer Raytheon and the U.S. Chamber of Commerce. (But they do not disclose the total funding numbers publicly.) Despite multiple requests, George Mason declined to comment for this story. The $762,000 in Google funding over a two-and-a-half-year stretch represents a significant chunk of the LEC’s total budget, which they list as $5 million in 2011 and $6.5 million in 2013. Checks ranged between $25,000 and $180,000. In November 2011, future FTC Commissioner Joshua Wright, then still a law professor at George Mason, wrote “Defining and Measuring Search Bias: Some Preliminary Evidence,” where he discounted Google’s “alleged bias” toward its own subsidiaries in searches. “From an antitrust perspective,” Wright wrote, “differences in own-content references across engines fail to indicate consumer harm,” but instead “imply the existence of intense competition among engines.” This is one of over 70 PowerPoint presentations and white papers featuring Google that can be found at the LEC website, most of which align with the company’s policy preferences. Manne has contributed to at least eight white papers endorsing Google’s policy positions on a host of issues, in addition to being a frequent pro-Google commentator in news articles and Congressional testimony. He appeared at a George Mason-sponsored Tech Freedom debate in 2012 on whether the FTC should sue Google, taking the “No” side. Manne also did not respond to a request for comment. A search of publicly available research papers between 2009 and today reveals 66 published studies by over 45 academics, where the authors were either “commissioned by Google,” “funded by Google,” or “supported by a gift from Google, Inc.” The papers overwhelmingly took Google’s side on privacy, copyright, patents and antitrust. Seventeen of the studies have some tie to George Mason, authored either by professors from the university or academics who have appeared at conferences there. Pro-Google papers spiked during 2011-2012, when the company faced intense antitrust scrutiny. Google-funded academic studies on antitrust went from one in 2010, to five in 2011, to 10 in 2012. Google often forwarded these studies to policymakers and journalists, proving widespread “independent” support from a large body of experts. But the fact that all the experts were paid in some manner by Google often got lost in the citations. Since 2011, the LEC has hosted an annual conference on search engines and online advertising. MIT’s Catherine Tucker, Seton Hall University’s Marina Lao and former Justice Department attorney David Balto have spoken at this annual conference. All three of them have received Google funding. 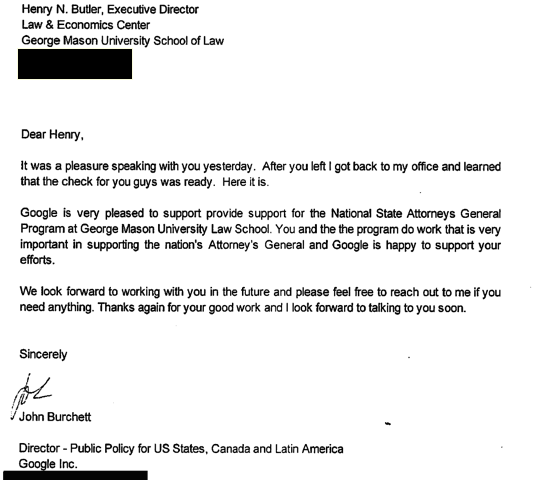 Google played an unusually active role in the George Mason conferences. The Washington Post has previously published emails showing Google public policy representatives giving LEC officials detailed information on what regulatory, law enforcement and Congressional staff to invite to the conference. 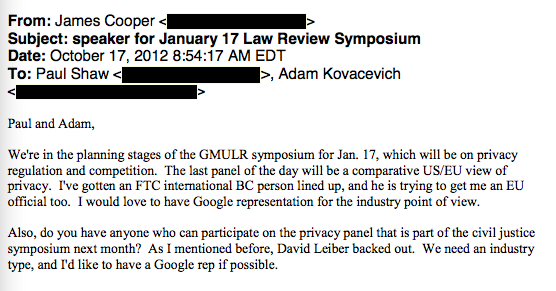 This invitee list included Beth Wilkinson, the attorney working on the case against Google at the FTC. 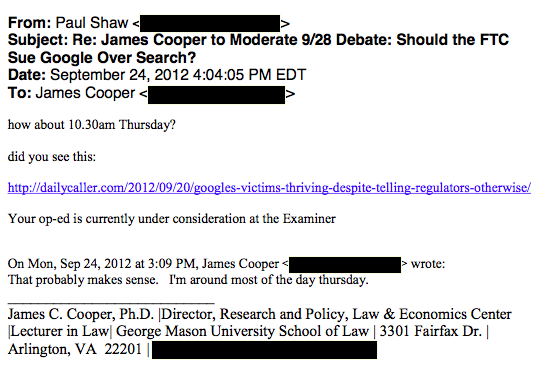 In a third email, Paul Shaw, a communications consultant at Google, tells Mason that he has shopped an op-ed of Cooper’s to the Washington Examiner. Cooper also wrote pro-Google academic papers, including this one for the George Mason Law Review entitled “Privacy and Antitrust: Underpants Gnomes, the First Amendment, and Subjectivity,” where he argues that privacy should not be included in any antitrust analysis. Cooper does not disclose Google’s funding of the LEC in the article. Other pro-Google articles by Cooper, like this one from Main Justice, do include disclosure. The growing peril of corporations buying off academics to support their perspective recently came to light when Senator Elizabeth Warren called out Robert Litan, a nonresident senior fellow at the Brookings Institution think tank, for producing suspect industry-funded research. Litan was subsequently relieved of his position with Brookings. It should come as no surprise that Litan also received money from Google to issue a paper in May 2012. Joshua Wright recently ended his tenure at the FTC, going back to George Mason to teach. With Google again threatened in the U.S. and Europe with additional lawsuits over anti-competitive practices, he is free to write on their behalf again and benefit from Google’s large storehouse of funds for academic underwriting.